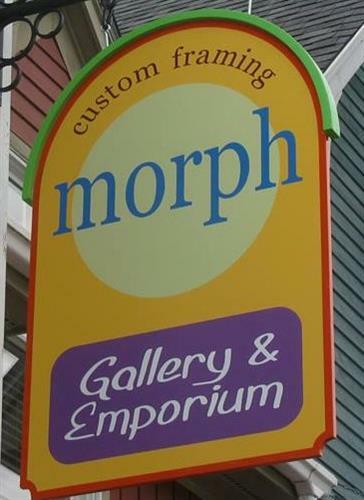 Winter: closed Sun - Tues.
My purpose and promise with Morph is to create and share beauty, and bring joy to all who step in the door. I carry work from Maine-based artists and crafters as well as from people “from away”. I have items that give back to charity, through a variety of methods. Lastly, if something is beautiful or makes me laugh it’s okay to be sold in my store. I also am a fine art picture framer of 25 years experience. I have framed everything from grandma's needlepoint sampler to golf clubs, from original Chagall prints to kindergarten art from the fridge. I love all of it! I repair existing frames, reuse antique frames and build new frames, and everything is done with an eye for conservation. Your artwork will last for generations in a healthy environment, and I will create that environment for you. Morph is where the elegant, cherishable, whimsical and unexpected meet!